Some of us may not closely associate the words "summer" and "comfort" as our sweat starts to pool in peculiar places thanks to high-rising temperatures (fun fact: this July in Philly we had about 11 days that reached over 90 degrees). At Pub & Kitchen, Chef Eli Collins says to hell with hellish heat indices, summer and comfort go together and it's what's for dinner. Every Wednesday, Collins plates up his favorite seasonal dishes alongside some summery sides. Tonight he's serving beer-brined chicken (brined then rubbed with barbecue spices) with panzanella and corn & leek pudding. It comes with a Sixpoint Rad, too. 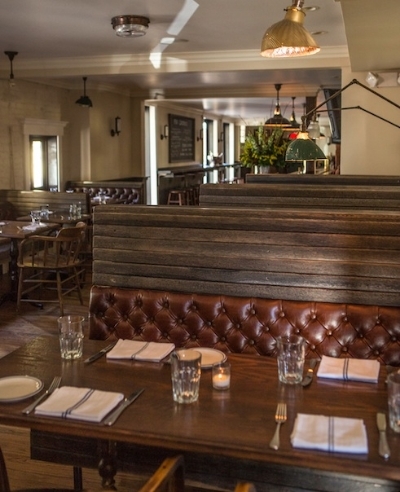 Good thing those booths at P&K are well-cushioned because we're ready to cozy up to all of that.